Examining the legal marijuana industry from the outside, it seems like there are enough new cannabis jobs to employ any interested job candidate across the country, but finding a viable position in the cannabusiness is easier said than done. When searching for the best cities to work in the marijuana industry, it’s helpful to gain a better understanding of the current cannabis job market. While more and more states are embracing cannabis with the passing of recreational and medical marijuana legalization in recent years and months, the industry is largely concentrated along metropolitan areas in the west coast and Colorado. The state of California was the first to pass comprehensive medical marijuana reform in 1996 with the Compassionate Use Act, while Colorado became the first state to pass recreational legalization in 2012. Along with fellow weed supporters Washington and Oregon, the middle left of the country is the region to find gainful employment working with weed. While these states as a whole are hotspots for cannabis jobs, the following represent the best cities to work in the marijuana industry. Inhale deep…hold it in…now release that fresh mountain air in America’s Mile High City. When talking about the best cities to work in the marijuana industry, we have to start off with Denver. It’s time to visit a legal cannabis dispensary, pick up a fresh “pre-rolled” joint and get the lowdown on Denver’s marijuana job market. It’s safe to say that Denver is one of the most progressive cities allowing recreational cannabis use, growth and possession. In fact, not only has the city’s industries incorporated the cannabusiness into its previously established culture, Denver has gone so far as to use cannabis as it’s major selling point for the tourism industry. As of the November 8th Presidential election of 2016, Denver became the first city in American history to put forth social use cannabis legislation, that would allow for business to obtain licenses for customer cannabis use. The ordinance appeared in the form of initiative 300, which passed by a respectable margin and requires interested businesses to obtain permission by their local merchant association to operate. While everything from art galleries, coffee shops and record stores can apply to allow social cannabis use, bars and other facilities that primarily serve alcohol, will not be allowed to partake in initiative 300. Additionally, all cannabis products consumed inside these facilities must be in the form of edibles or vaping, smoking cannabis can only be done on the business’s grounds. The kind of cannabis revolution that Denver is leading supports why it is truly one of the best cities to work in the cannabis industry. Here in Denver, you won’t have to go far before stumbling across a cannabis dispensary. Working at these neighborhood pot shops are informative, enthusiastic employees working in reception, budtending, management, security and other positions. The sales division of the marijuana industry employs some of the most individuals with part and full time positions that facilitate the sale of cannabis products to medical patients and adult customers. As I mentioned earlier, Denver has leveraged cannabis to bolster its tourism industry, bringing in significant taxable revenue on cannabis and earnings from pricey niche tour and vacation packages. If you are finding difficulty winning a job in a dispensary, consider starting in a more entry level marijuana job in one of the cannabis tourism industry’s associated jobs. Though you may not be able to find full time work on a cannabis farm in Denver, there are still opportunities for trimming jobs, in order to prepare marijuana flower to be packaged and sold in dispensaries. Trimming is the process of removing excess plant matter from cannabinoid rich cannabis flowers. By removing fan leaves, sugar leaves and any dead plant matter, trimmers optimize THC and CBD concentration per bud. This gives the consumer a better tasting product that will offer more significant effects. Portland has already staked its claim as the city of weird, but what about weed? Luckily for Oregonians, Portland’s got cannabis covered. Like Denver, Portland has accepted cannabis culture and then some, proudly making itself one of the epicenters of cannabis activism and the best cities to work in the marijuana industry. The job market is booming here to, with green plus signs virtually everywhere in sight. Like the aforementioned cities, Portland marijuana dispensary jobs are a go-to for entry level and customer service workers. There are other opportunities, though, that some job seekers may not immediately consider as options. For starters, Portland has some of the best cannabis publications and journalism in the entire world. Nearly every newspaper or magazine you buy or pick up for free at one of the many cozy coffee shops in the city will contain well researched articles and other content on cannabis legislation, culture and products. But back to the dispensaries–to give you an idea of the extent of cannabis’ hold in the City of Roses, let’s learn about the Green Mile. No, I’m not talking about the movie that made you cry about a man who cries during a movie–Portland’s Green Mile is located on Sandy Boulevard where you will find every cannabis dispensary of your dreams from established mom and pop entities to growing local chains. The green mile may boast the most dispensaries proportionally for the area of Northeast Portland, but the city has many more shops to show up. You might be wondering what makes one dispensary different or “better” than the other. To answer this question, it all depends on what you’re looking for. If you’re on a budget, your main concern may be where to buy the most inexpensive weed or find the best deals. To solve this issue, your best bet may be heading on over to Nectar PDX on Sandy. Here, you will find industry low prices, free pre-rolls on friday (some restrictions apply) and budtenders who are great at thinking on their feet. WHile Nectar is a great place to go when your bank account balance is frightening you, but it may involve waiting in a long line of similarly frugal stoners. If you’re looking for a great atmosphere, reasonable prices and the most knowledgeable budtenders out there, I would highly recommend both Treehouse Collective (THC) and Collective Awakenings. Both of these shops (which happen to be very close to one another) consistently update menus and appear on lists of Portland’s best dispensaries. Oregon and California dominate the cultivation scene and provide the most growing jobs proportionally. While the Portland metropolitan area may not provide the ideal location for large scale grow operations, its proximity to southern Oregon provides opportunities (especially in the summer and fall) for large scale trimming and cultivation work. It won’t take much convincing to realize that Portland is one of the best cities to work in the marijuana industry upon visiting. Bridgetown is confident in its alternative setup and proud of how it has brought cannabis into popular culture, in thanks to a little TV show called Portlandia. Like its sister city to the south, Portland–Seattle is another one of the best cities to work in the marijuana industry. This bustling Pacific Northwest city facilitates many jobs in the cannabis industry and provides consumers with a smorgasbord of product options to suit a diverse array of needs. Seattle has classically been a hub for musicians and has birthed some major movements for social reform, making it a perfect city to pave the way for comprehensive legalization efforts. The jobs reflected in Seattle’s new weed economy appear widely along the spectrum, covering sales and tourism, as well as activism and freelance work. Seattle is a hub for technology and web development for many industries, and cannabis is no exception. Industry leading websites like Leafly are headquartered in Seattle and lead the online revolution of cannabusinesses. Leafly is a highly beneficial resource to the marijuana community as it aggregates dispensaries across the country for medical and recreational customers and tells them where shops are located. Additionally, Leafly provides information on dispensary menus, hours and discounts and promotions. What makes the site even more successful is its well researched and written online content. Leafly is as much an educational resource as it is a search engine. Another great element of the site are its aggregation of different cannabis strains. By assigning specific domains to each, fans can review each strain and offer their opinions on its effects to create a resource individuals can use as suggestions before making a purchase. Though California has only recently passed recreational legalization, San Francisco and other major cities throughout the state have consistently supported the movement for acceptance of marijuana as a medically beneficial, underestimated substance. For this reason, this bay area gem is one of the best cities to work in the marijuana industry. Counter Culture relics like Haight-Ashbury epitomize the development of cannabis culture–how it has become more commodified and mainstreamed, while maintaining an alternative flair that you can never quite put your finger on. 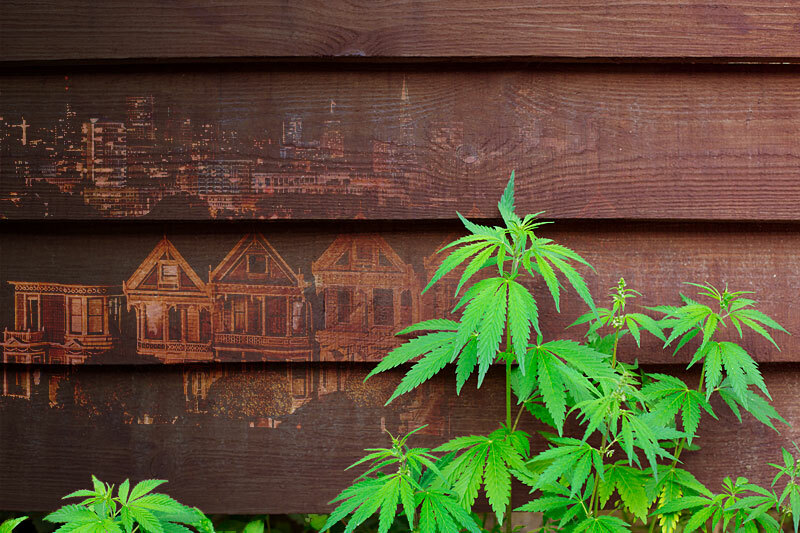 When it comes to jobs, San Francisco has them–but mostly in medical cannabis dispensaries. Until adult use regulations officially kick in late in 2017 or even 2018, the industry is business as usual. While it’s a relief that cannabis possession and “sharing” have been effectively decriminalized, the lapse in time will put a hold on the establishment of recreational dispensaries. In the meantime, there are plenty of opportunities to work as budtenders, medical receptionists, or as caregivers. One of the more convoluted, yet important jobs in the medical cannabis industry is being a caregiver. Caregivers are allowed to grow, process and transport cannabis products for medical marijuana patients. Caregivers are primarily important for patients without access to cannabis dispensaries, or who cannot seek out products on their own due to physical limitations. The process of working as a medical marijuana caregiver was more straightforward when it was first allowed, though now it is embedded deep into the recesses of cannabis industry bureaucracy. Again, due to the cannabis industry’s current “puberty” phase, legal cannabis growing jobs in the San Francisco area are few and far between. While the city is wonderfully positioned to facilitate travel out to grow operations in rural counties, it’s perhaps better to wait until the cultivation industry is more standardized. All the Best Cities to Work in the Marijuana Industry? While the four cities mentioned above represent some hotspots for cannabis jobs, they represent only a small fraction of the regions celebrating cannabis legalization and embracing the changes that come along with the Green Rush. As you continue to seek information on acquiring jobs in the industry, keep an open mind when looking for the best cities to work in the marijuana industry. More and more, areas in the east coast like Boston are becoming more suited to taking on cannabis culture, as well as cities in the midwest like Chicago. For the most updated information, visit Norml.org.